Here’s a compelling reason to spend more time in art museums: Observing art can help us build life skills. “The study of art can enhance our perception, and our ability to translate to others what we see,” says Amy E. Herman, former museum educator and the author of “Visual Intelligence: Sharpen Your Perception, Change Your Life. As a parent, you can help your children develop these abilities by encouraging meaningful interactions with art. Not sure where to begin? Let these expert tips lead the way. “Enjoy the museum at your child’s pace, and don’t try to see everything in one visit,” says the Art Institute of Chicago in their parent education video. During your visit, devote time to the few pieces that your child expresses interest in, and once you sense your child is no longer engaged, it’s time to leave. For preschoolers, the Art Institute recommends playing a matching game, where children bring along pictures of selected artworks to search for the actual artworks in the museum. For older kids, the Art Institute suggests letting them explore the museum independently, as well as sitting together to sketch and share observations about a work that your child likes, if time and space permit. If exhibits are related to what your child is studying in school, this can be a springboard for discussion too. “It doesn’t matter what the museum labels, the Wikipedia pages, or the textbooks say. Art becomes yours when you look at it,” says art teacher and museum educator Cindy Ingram. Don’t be afraid to hazard a guess about the meaning or significance of an art piece—it can be fun to see how you or your child’s interpretation of a work differs from the artist’s intention. Use the “visual thinking strategies” method. For a better idea of how these questions help stimulate thinking, watch visual thinking sessions in action (with younger kids, and with older kids) before trying it with your child. 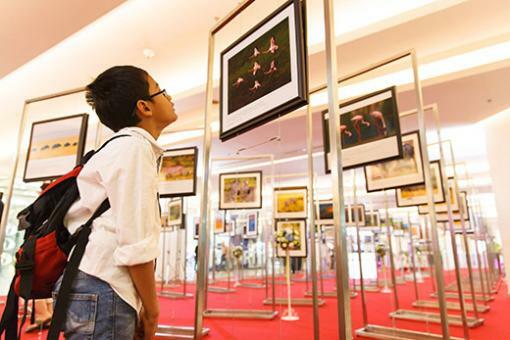 Kids can learn to appreciate an art piece without touching it. Creating a scavenger hunt: Look for colours, shapes, and more. Playing a movement game, where you ask kids to pose or move like figures in the artworks they see. Structure your experience with the help of an activity sheet. Does this exhibition have its own name? If so, what does the name say about the objects here? What did I learn from the label that I wouldn’t have known just by looking at the object? How would I describe this object to a friend?